Alveolar macrophages are major contributors to lung innate immunity. Although alveolar macrophages from cystic fibrosis (CF) transmembrane conductance regulator−/− mice have impaired function, no study has investigated primary alveolar macrophages in adults with CF. CF patients have low levels of insulin-like growth factor 1 (IGF-1), and our prior studies demonstrate a relationship between IGF-1 and macrophage function. We hypothesize that reduced IGF-1 in CF leads to impaired alveolar macrophage function and chronic infections. Serum and bronchoalveolar lavage (BAL) samples were obtained from eight CF subjects and eight healthy subjects. Macrophages were isolated from BAL fluid. We measured the ability of alveolar macrophages to kill Pseudomonas aeruginosa. Subsequently, macrophages were incubated with IGF-1 prior to inoculation with bacteria to determine the effect of IGF-1 on bacterial killing. We found a significant decrease in bacterial killing by CF alveolar macrophages compared with control subjects. CF subjects had lower serum and BAL IGF-1 levels compared with healthy control subjects. Exposure to IGF-1 enhanced alveolar macrophage macrophages in both groups. Finally, exposing healthy alveolar macrophages to CF BAL fluid decreased bacterial killing, and this was reversed by the addition of IGF-1, whereas IGF-1 blockade worsened bacterial killing. Our studies demonstrate that alveolar macrophage function is impaired in patients with CF. 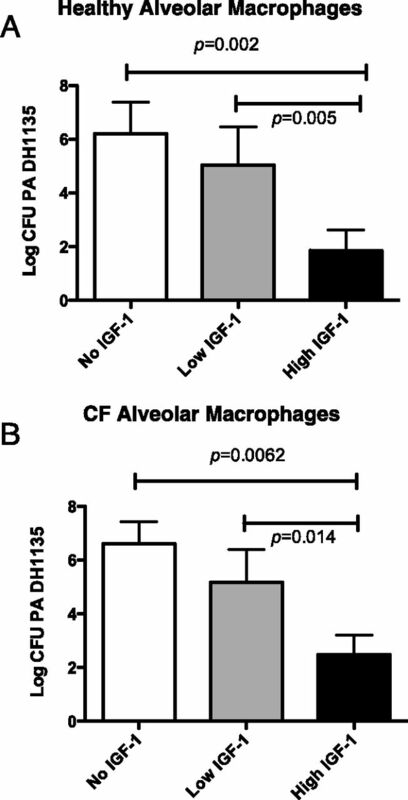 Reductions in IGF-1 levels in CF contribute to the impaired alveolar macrophage function. Exposure to IGF-1 ex vivo results in improved function of CF alveolar macrophages. Further studies are needed to determine whether alveolar macrophage function can be enhanced in vivo with IGF-1 treatment. Cystic fibrosis (CF) is caused by mutations of the CF transmembrane conductance regulator (CFTR) gene, which encodes a chloride channel that is expressed on many cell surfaces. The absence of functional CFTR in airway epithelia leads to abnormal airway clearance mechanisms, which favor chronic infection by Pseudomonas aeruginosa and other bacteria. Although the cause of disease in CF is clearly related to lack of functional CFTR, the mechanism of chronic infection remains less clear (1). Alveolar macrophages are major contributors to the innate immune function of the lung environment and are critical for bacterial phagocytosis and killing, Ag presentation, and neutrophil recruitment. Studies have shown that alveolar macrophages isolated from CFTR−/− mice are able to efficiently phagocytose live bacteria, but have impaired ability to kill phagocytosed bacteria (2, 3). A recent study using a porcine model of CF found evidence of defective bacterial clearance at birth (4), suggesting impaired innate immune function in the lung. Lastly, a study in humans demonstrated impaired bacterial killing in monocyte-derived macrophages isolated from CF subjects (5). Our current study demonstrates impaired bacterial killing by primary human alveolar macrophages isolated from subjects with CF. Studies have consistently shown that serum insulin-like growth factor-1 (IGF-1) levels are reduced in adult patients with CF (6–8), although the reason for this defect is not known. IGF-1, a hormone produced by the liver, has a similar molecular structure to insulin. IGF-1 plays an important role in childhood growth and continues to have anabolic effects into adulthood (9). Approximately 98% of IGF-1 is always bound to one of six IGF-binding proteins (IGFBPs). IGFBP-3, the most abundant protein, accounts for 80% of all in vivo binding. IGFBP-2 binds IGF-1 with great affinity and prevents binding of IGF-1 to its receptor, thus blocking its signaling activity (10, 11). We have previously shown that IGF-1 levels are reduced during human and murine sepsis (12, 13). The role of cytokines in the pathophysiology of reduced IGF-1 has been clearly established in sepsis (14–18), so it is plausible that inflammation plays a role in the reduced IGF-1 levels found in CF as well. However, a more recent study demonstrated lower IGF-1 levels in CF patients at birth, which is thought to be prior to the onset of inflammation within the lung (19). Thus, the reduction in serum IGF-1 may be innate. The consequences of low IGF-1 on innate immunity in CF are not known. Our prior studies demonstrate a clear relationship between low levels of serum IGF-1 and tissue macrophage dysfunction in a murine model of sepsis (12) as well as a relationship between low levels of serum IGF-1 and increased bacteremia in human sepsis (13). Interestingly, one study demonstrated that the treatment of healthy bovine alveolar macrophages with IGF-1 enhanced phagocytosis and bacterial killing (20). A subsequent study showed that IGF-1 improves murine neutrophil and monocyte phagocytic function (21). To our knowledge, no prior study has investigated the relationship between IGF-1 and alveolar macrophage function in human subjects. These prior studies linking low IGF-1 levels to impaired phagocyte function in animal models led us to hypothesize that low levels of IGF-1 in CF contribute to impaired alveolar macrophage and may lead to the development of chronic respiratory infections. Healthy subjects (n = 8) were enrolled if they were between 18 and 45 y of age, nonsmokers, had no underlying medical conditions, and did not take chronic medications other than oral contraceptives. Subjects with CF (n = 8) were enrolled if they had an forced expiratory volume in 1 s >50% predicted, were not currently having an exacerbation, and were nonsmokers. All female subjects underwent a pregnancy test and were excluded if positive. Following informed consent, subjects underwent phlebotomy and flexible bronchoscopy. Briefly, after local anesthesia with viscous lidocaine to the posterior pharynx and i.v. sedation, a bronchoscope was passed through the vocal cords. Bronchoalveolar lavage (BAL) fluid was obtained from the right middle lobe, right upper lobe, and lingula (five aliquots of 20 ml from each segment) for isolation of alveolar macrophages. Following the procedure, subjects were monitored until they were stable for discharge. Additional CF subjects (n = 12) had serum obtained for measurement of IGF-1 at baseline and during an acute exacerbation. This study was approved by Committee for the Protection of Human Subjects of the Geisel School of Medicine at Dartmouth. BAL fluid was obtained as described above. Alveolar macrophages were isolated as previously described (22, 23). Briefly, BAL fluid was filtered, centrifuged, and washed twice. For CF macrophages, cells were incubated with CD15 microbeads and run over an LD column on the QuadroMACS magnet (Miltenyi Biotec, Bergisch Gladbach, Germany) to deplete all neutrophils. Alveolar macrophages were cultured in RPMI 1640 media with Glutamax (Life Technologies, Grand Island, NY) with gentamicin (80 mg/ml). Differential cell counts were determined using a Wright-Giemsa–stained centrifuge preparation. All cell preparations had >95% alveolar macrophages. Experiments were done with cells at a concentration of 1 × 106/ml. Cells were spun down and stained with PE anti-human CD14, FITC anti-human mannose receptor (MR), or PE anti-human TLR4. All Abs were obtained from BioLegend (San Diego, CA). Cytometric analysis of stained cells was performed using a Beckman Calibur flow cytometer (Beckman Coulter, Brea, CA). All cells were gated on a forward scatter at the y-axis and the fluorescence-gated channel at the x-axis. All cells that are fluorescent positive with a ≥1 × 101 value are gated as positive staining based upon unstained gating controls. All voltages for forward scatter, side scatter, and fluorescence are optimized and kept the same for all experiments. Alveolar macrophages were cultured as described in each figure legend. A subset of cells was incubated with recombinant human IGF-1 or IGFBP-2 (R&D Systems, Minneapolis, MN). Cells were subsequently exposed to clinical P. aeruginosa strains DH1133 and DH1135 (multiplicity of infection [MOI] of 10) in antibiotic-free conditions. The clinical strains were a generous gift from Dr. Deborah Hogan (Geisel School of Medicine at Dartmouth) and have been described previously (24). After 1 h, gentamicin (80 mg/ml) was added to kill the nonphagocytosed bacteria, and the cells were allowed an additional 3 h for bacterial killing. Subsequently, cells were lysed and plated for bacterial counts. In a subset of experiments, the supernatants were removed after 1 h, and the cells were lysed and plated on Pseudomonas isolation agar for bacterial counts to determine the number of bacteria phagocytosed. ELISA kits for human IGF-1 were obtained from R&D Systems (Minneapolis, MN) and were used according to the manufacturer’s instructions. Statistical analyses were performed using GraphPad Prism (GraphPad, San Diego, CA). Student t test was used to compare bacterial phagocytosis and killing between CF and non-CF alveolar macrophages. We used ANOVA followed by Tukey test for multiple comparisons to compare IGF-1 levels at baseline and during exacerbation as well as bacterial killing by alveolar macrophages treated with different amounts of IGF-1. Linear regression was used to test for a correlation between IGF-1 and bacterial killing. A total of eight CF subjects and eight healthy control subjects underwent bronchoscopy for isolation of alveolar macrophages. The demographic and genetic attributes of this CF cohort are listed in Table I. The median age of the CF cohort was 26.63 y. The median age of the healthy control subjects was 29.5 y. Three quarters of CF patients possessed two ΔF508-CFTR alleles. For measurement of serum IGF-1 at baseline and during exacerbation, we enrolled 12 additional CF subjects with a median age of 27 y. The BAL culture results described in Table I reflect the chronic colonization seen in these subjects during the past 6 mo. Using magnetic beads labeled with the human neutrophil marker CD15, we sought to develop a protocol to effectively isolate a pure population of alveolar macrophages from subjects with CF. To determine whether CF subjects had more alveolar macrophages, we collected BAL fluid from control and CF subjects. The total cell count from each patient’s BAL was recorded. After eliminating neutrophils from BAL fluid using CD15 magnetic beads, the remaining cells were counted and reported as total macrophages (Fig. 1A). In healthy subjects, of 5.7 ± 0.6 (mean ± SD) × 105 cells/ml total cells collected, 5.5 ± 0.5 × 105 cells/ml were alveolar macrophages. In CF subjects, we found a larger absolute number of macrophages (6.7 ± 0.6 × 105 cells/ml). However, they represented a smaller percentage of the total cells (8.3 ± 0.6 × 105 cells/ml). Culture of alveolar macrophages isolated from subjects with CF demonstrates no viable P. aeruginosa in the isolated cells (data not shown). This is important for our studies of effective killing of P. aeruginosa by isolated macrophages. Isolation of alveolar macrophages from adult patients with CF. (A) Subjects with CF underwent bronchoscopy with BAL. BAL fluid was filtered, and neutrophils were depleted using magnetic beads for CD15. Total cell count was measured before and after neutrophil depletion and demonstrates similar macrophage numbers in CF subjects compared with healthy control subjects. (B) Flow cytometry for the macrophage marker CD14 was performed on cells isolated from CF subjects. The image shown is representative of three separate experiments and demonstrates that 98.8% of cells isolated after neutrophil depletion are CD14+ macrophages. FSC-H, Forward light scatter–height. Flow cytometry of the macrophage marker CD14 was performed on CF macrophages only to assess the purity of the cell population and determine the effectiveness of the neutrophil depletion. We found that 98.8% of cells isolated after neutrophil depletion were CD14+ macrophages (Fig. 1B), suggesting that this is an effective protocol for isolating alveolar macrophages from subjects with CF. Alveolar macrophages can be activated via several pathways that influence their cell surface markers (25–28). To determine the predominant activation pathway of CF alveolar macrophages, flow cytometry for the activated macrophage surface markers MR and TLR4 was performed on CF alveolar macrophages (Fig. 2). The panels on the left demonstrate appropriate gating at 101. Nearly 98% of cells were MR positive (Fig. 2A), whereas 95% of cells were TLR4 negative (Fig. 2B). 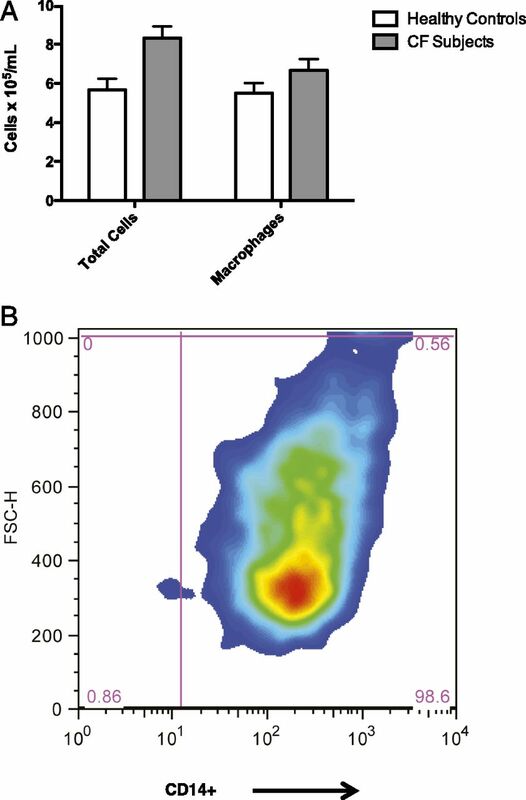 Flow cytometry performed on healthy alveolar macrophages demonstrates that they were uniformly inactivated and did not express either MR or TLR4 on the cell surface (data not shown). These data are consistent with a recent study suggesting MR predominance in CF macrophages, especially in the setting of Pseudomonas infection (29). CF alveolar macrophages upregulate the MR and downregulate TLR4. Alveolar macrophages were isolated from subjects with CF as described. 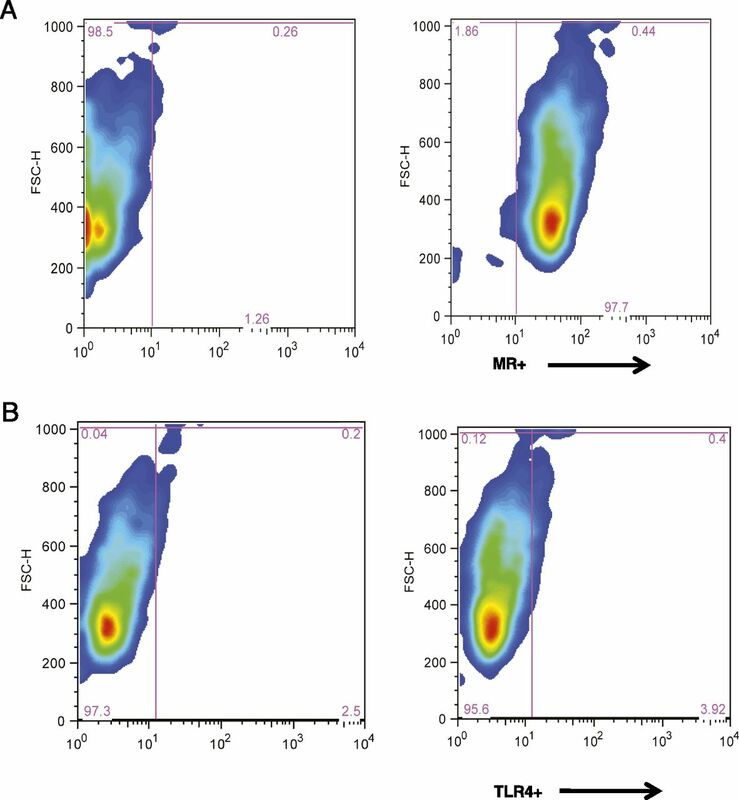 Flow cytometry for the activated macrophage surface markers MR (A) and TLR4 (B) was performed on CF alveolar macrophages. The left panels demonstrate flow cytometry performed on unstained cells to determine the gating scheme. The images shown are representative of three separate experiments and demonstrate that 97.7% of cells are MR positive, and 95.6% of cells are TLR4 negative. FSC-H, Forward light scatter–height. Serum IGF-1 subjects in CF patients were measured at baseline and during stages of an exacerbation and compared with levels measured in healthy control subjects. ANOVA followed by Tukey test for multiple comparisons demonstrates significantly reduced serum IGF-1 at baseline in CF subjects compared with healthy control subjects (Fig. 3A). This is consistent with other studies that have found decreased serum IGF-1 in CF. A significant decrease in IGF-1 in CF subjects during an acute exacerbation compared with baseline was also noted. If IGF-1 is important for effective immune cell function in CF, this decline during an acute exacerbation could be clinically important and impact the patient’s ability to fight infection. CF patients have reduced serum and BAL IGF-1 levels. (A) Serum IGF-1 was measured by ELISA in CF subjects (n = 12) at baseline and during an acute exacerbation. IGF-1 was also measured in healthy control subjects (n = 8). ANOVA followed by Tukey test for multiple comparisons demonstrates significantly lower serum IGF-1 at baseline in CF subjects compared with healthy control subjects (p < 0.001). There was also a significant decrease in IGF-1 in CF subjects during an acute exacerbation compared with baseline (p < 0.01). (B) IGF-1 was measured in BAL fluid from CF subjects (n = 6) and healthy control subjects (n = 8). Student t test demonstrates significantly lower IGF-1 levels in the CF subjects compared with healthy control subjects (p < 0.001). Although studies have consistently shown reduced serum IGF-1 in CF, no prior studies have looked at IGF-1 levels in the local environment of the lung. Therefore, we measured IGF-1 levels in BAL fluid obtained from CF subjects and healthy control subjects. Student t test demonstrates significantly lower IGF-1 levels in the BAL fluid collected from CF subjects compared with healthy control subjects (106 ± 29 versus 393 ± 98 ng/ml [mean ± SD]) (Fig. 3B). Because our subsequent experiments involve incubating macrophages with IGF-1, we elected to use a final IGF-1 concentration of 400 ng/ml as our high IGF-1 level and 100 ng/ml as our low IGF-1 level. To determine if macrophages isolated from CF subjects were able to phagocytose and kill bacteria as well as control macrophages, we isolated alveolar macrophages from CF subjects and healthy control subjects and incubated them with the clinical P. aeruginosa strains DH1133 and DH1135. Cells were exposed to P. aeruginosa for 1 h to allow for phagocytosis. After 1 h, cells were lysed, and bacteria were quantified to determine the percentage of bacteria phagocytosed. We found no difference in the percentage of bacteria phagocytosed by healthy alveolar macrophages compared with CF alveolar macrophages (Fig. 4A). CF alveolar macrophages have impaired bacterial killing, which correlates with IGF-1 levels. (A) Alveolar macrophages were isolated from CF subjects and healthy control subjects as described. Cells were exposed to the clinical P. aeruginosa strains DH1135 (left panel) and DH1133 (right panel) at an MOI of 10. After 1 h, the supernatants were removed, the cells were lysed, and the intracellular bacteria were quantified to determine the percentage of bacteria that were phagocytosed. Student t test demonstrates no difference in the percentage of bacteria phagocytosed by CF or healthy alveolar macrophages. (B) Alveolar macrophages were isolated from CF subjects and healthy control subjects as described. Cells were exposed to the clinical P. aeruginosa (PA) strains DH1135 (left panel) and DH1133 (right panel) at an MOI of 10. After 1 h, gentamicin (80 mg/ml) was added to the media to kill nonphagocytosed bacteria. After an additional 3 h, remaining live bacteria were quantified. *Significant difference in bacterial killing between control and CF macrophages with p < 0.001 (left) and p < 0.01 (right). Graph represents the mean and SD of four separate experiments. (C) IGF-1 was measured in serum and BAL fluid from the same CF subjects. 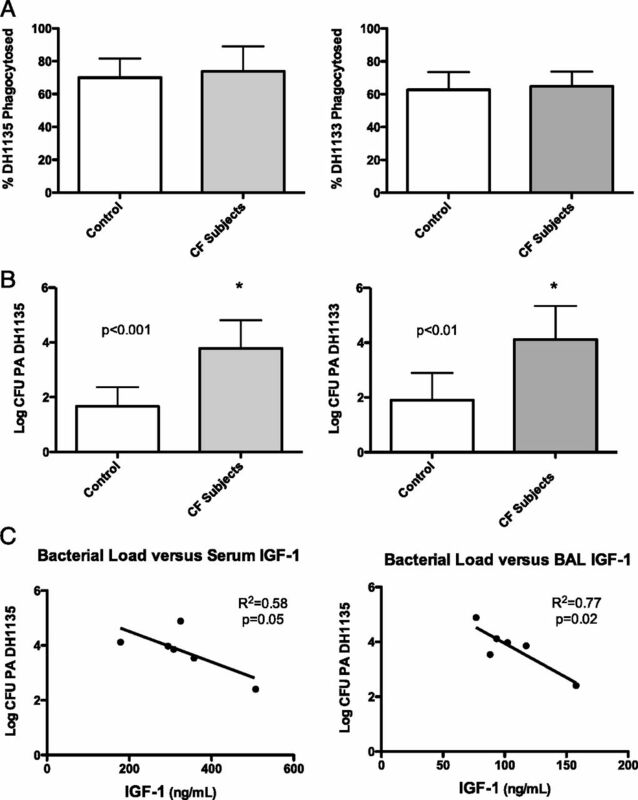 Linear regression analysis demonstrates a significant inverse correlation between serum and BAL IGF-1 and remaining bacterial load (R2 = 0.58, p = 0.05 for serum; R2 = 0.77, p = 0.02 for BAL). In separate experiments, cells were exposed to P. aeruginosa for 1 h to allow for phagocytosis, and, subsequently, gentamicin was added to kill nonphagocytosed bacteria. Cells were allowed an additional 3 h to kill the phagocytosed bacteria and then lysed and plated for bacterial quantification. Bacterial culture of the supernatants following administration of gentamicin demonstrates effective killing of P. aeruginosa by gentamicin (data not shown). Using a Student t test, we demonstrated a significant decrease in bacterial killing of both strains by CF alveolar macrophages compared with healthy control subjects (Fig. 4B). Experiments performed in the absence of gentamicin demonstrate a similar reduction in bacterial killing by CF alveolar macrophages (data not shown). To determine whether a relationship exists between IGF-1 levels and bacterial killing by CF alveolar macrophages, we compared serum and BAL fluid IGF-1 levels with the live bacterial load of P. aeruginosa DH1135 remaining after a 4-h incubation with CF alveolar macrophages (Fig. 2A). We found a significant inverse correlation between both serum and BAL IGF-1 levels and bacterial load of DH1135 (Fig. 4C), suggesting a relationship between low levels of IGF-1 and impaired bacterial clearance by alveolar macrophages. To determine the effects of IGF-1 on alveolar macrophage function, we incubated alveolar macrophages with increasing levels of IGF-1 (none, 100 ng/ml, and 400 ng/ml) for 48 h and then exposed to the cells to P. aeruginosa clinical strain DH1135. The live bacteria were counted and log transformation was performed to correct for unequal variances. We found a significant increase in bacterial killing in the cells exposed to high IGF-1 compared with low IGF-1 and no IGF-1 (Fig. 5A). We also found a significant improvement in bacterial killing in CF alveolar macrophages incubated with a high concentration of IGF-1 compared with a low concentration of IGF-1 and no IGF-1 (Fig. 5B). IGF-1 improves bacterial killing by healthy and CF alveolar macrophages. (A) Alveolar macrophages were isolated from healthy volunteers as described. Cells were incubated for 40 h with media and no IGF-1, low IGF-1 (100 ng/ml), or high IGF-1 (400 ng/ml). Cells were then exposed to P. aeruginosa (PA) DH1135. After 1 h, gentamicin (80 mg/ml) was added to kill nonphagocytosed bacteria. After an additional 3 h, remaining live bacteria were quantified. ANOVA followed by Tukey test for multiple comparisons demonstrates increased bacterial killing in the cells exposed to high IGF-1 compared with low IGF-1 (p = 0.005) and no IGF-1 (p = 0.002). Graph represents the mean and SD of four separate experiments. (B) Alveolar macrophages were isolated from CF subjects as described. Cells were incubated for 40 h with media and no IGF-1, low IGF-1 (100 ng/ml), or high IGF-1 (400 ng/ml). Cells were then exposed to P. aeruginosa (PA) DH1135. After 1 h, gentamicin (80 mg/ml) was added to kill nonphagocytosed bacteria. After an additional 3 h, remaining live bacteria were quantified. ANOVA followed by Tukey test for multiple comparisons demonstrates increased bacterial killing in the cells exposed to high IGF-1 compared with low IGF-1 (p = 0.014) and no IGF-1 (p = 0.0062). Graph represents the mean and SD of four separate experiments. Given that supplementing IGF-1 improves bacterial killing by CF alveolar macrophages, we sought to determine whether the BAL fluid from CF subjects, which contains less IGF-1 than control subjects, would render alveolar macrophages from healthy subjects less functional. Subsequently, we added back IGF-1 to the CF BAL fluid to determine whether this would negate any adverse effects of the CF BAL fluid. Alveolar macrophages from healthy volunteers were exposed to 10% healthy BAL fluid, 10% CF BAL fluid, or 10% CF BAL fluid plus 400 ng/ml IGF-1 for 40 h. Cells were then exposed to P. aeruginosa clinical strain DH1135, and the remaining live bacteria were quantified (Fig. 6A). We found that exposure to CF BAL fluid resulted in a significant decrease in bacterial killing compared with healthy BAL fluid. The addition of IGF-1 to CF BAL significantly enhanced bacterial killing by alveolar macrophages, suggesting that IGF-1 may be an important factor regulating the effective function of alveolar macrophages in patients with CF. CF BAL fluid causes impaired killing by healthy alveolar macrophages that is improved by IGF-1. Alveolar macrophages were isolated from healthy volunteers as described. (A) Cells were exposed to 10% healthy BAL fluid, 10% CF BAL fluid, or 10% CF BAL fluid plus 400 ng/ml of IGF-1 for 40 h. Cells were then exposed to P. aeruginosa (PA) DH1135. After 1 h, gentamicin (80 mg/ml) was added to kill nonphagocytosed bacteria. After an additional 3 h, remaining live bacteria were quantified. ANOVA followed by Tukey test for multiple comparisons demonstrates decreased bacterial killing in the cells exposed to CF BAL fluid compared with healthy BAL fluid (*p < 0.001). There was also a significant improvement in bacterial killing in cells treated with CF BAL fluid and IGF-1 compared with CF BAL fluid alone (*p < 0.001). (B) Cells were exposed to 10% healthy BAL fluid, 10% CF BAL fluid, or 10% healthy BAL fluid plus IGFBP-2 (2 μg/ml). Bacterial killing was assessed as described above and demonstrated decreased bacterial killing after addition of IGFBP-2 (*p < 0.001). Graphs represent the mean and SD of three separate experiments. To further investigate the importance of IGF-1 in regulating alveolar macrophage function, we added IGFBP-2 to alveolar macrophages exposed to healthy BAL fluid. IGFBP-2 is known to bind IGF-1 with a much greater affinity than IGF-1 binds its receptor and is known to inhibit the biological effects of IGF-1 (10, 11). We found that blockade of IGF-1 activity by IGFBP-2 significantly decreased bacterial killing by healthy alveolar macrophages (Fig. 6B). This provides further evidence for the critical role of IGF-1 in regulating alveolar macrophage function. Further studies are needed to elucidate the mechanism by which IGF-1 exerts its effect on alveolar macrophages. In this study, we investigated the ability of primary alveolar macrophages isolated from subjects with CF to effectively kill clinical strains of P. aeruginosa. We found that CF alveolar macrophages had impaired ability to kill P. aeruginosa compared with healthy alveolar macrophages. Subsequently, we found that serum and BAL IGF-1 levels were lower in subjects with CF compared with healthy control subjects. We then evaluated whether differences in IGF-1 concentration lead to differences in alveolar macrophage function. We found that incubation with high levels of IGF-1 leads to enhanced bacterial killing by both healthy and CF alveolar macrophages. Lastly, we sought to determine whether the low level of IGF-1 in CF BAL fluid contributes to the impaired alveolar macrophage function. We found that healthy alveolar macrophages had reduced bacterial killing after incubation with CF BAL fluid, and this effect was lessened significantly by the addition of IGF-1, suggesting that IGF-1 is an important regulator of alveolar macrophage function in CF. The lungs are uniquely exposed to environmental pathogens. Alveolar macrophages represent the front-line cellular defense against these inhaled invaders. Normally, these cells phagocytose and kill organisms within endocytic vacuoles that produce oxygen metabolites, lysozyme, antimicrobial peptides, and proteolytic enzymes (30). Depending on local cytokine profiles and the nature of encountered pathogens, alveolar macrophages undergo either classical or alternative activation. Induced by IFN-γ and/or bacterial LPS, classically activated macrophages are traditionally thought to possess enhanced microbicidal and tumoricidal properties and secrete high levels of IL-12, IL-23, and TNF-α (31). In contrast, alternatively activated macrophages respond to IL-4 or IL-13, immune complexes, and certain hormones. Several papers have suggested that alternatively activated macrophages are not adept at killing microbes and are, in fact, more susceptible to infections (26, 32–34). One of the main characteristics of alternatively activated macrophages is downregulation of TLRs on the cell surface. Classically activated macrophages express TLR4, a cell-surface marker that binds LPS and initiates an inflammatory cascade in response to LPS binding. In alternatively activated macrophages, TLRs are downregulated, resulting in a less robust response to Gram-negative infections. A recent study demonstrated that alveolar macrophages isolated from patients with CF were more likely to be activated via the alternative pathway in patients with lower lung function and those infected with P. aeruginosa (29). Our study confirms the finding of more alternatively activated alveolar macrophages in CF. Several studies have evaluated alveolar macrophage function in murine models of CF. Early studies demonstrated that alveolar macrophages isolated from CFTR−/− mice have impaired ability to kill phagocytosed bacteria due to inability to acidify phagolysosomes (2, 3). This defect would allow the bacteria the opportunity to escape and reinfect the airway, leading to chronic airway infections. However, subsequent studies have not been able to confirm an impairment in lysosomal acidification in macrophages and epithelial cells isolated from CFTR−/− mice (35, 36). Therefore, although the mechanism of impaired bacterial killing by murine alveolar macrophages is still unclear, there is clear evidence that alveolar macrophages from CFTR−/− mice have an impaired ability to kill phagocytosed bacteria (2). Although there have been studies investigating alveolar macrophage function in murine models of CF, these studies are limited in that murine models of CF do not develop the same lung disease seen in patients with CF. Studies have consistently shown that serum IGF-1 levels are reduced in adult patients with CF (6–8), although the exact mechanism remains unclear. IGF-1 is a hormone with many of the same signaling properties of insulin but without the glycemic effect. IGF-1 exerts the majority of its effect via the IGF-1 receptor, although it can also bind to both the insulin receptor and heterodimers of the insulin receptor, as well as the IGF-1 receptor (9). IGF-1 is one of the most potent natural activators of the Akt signaling pathway, a stimulator of cell growth and proliferation, and an inhibitor of apoptosis. The majority of IGF-1 in circulation binds to one of six IGFBPs. IGFBP-3 is the most abundant binding protein, accounting for >80% of IGF-1 binding (9). The majority of IGF-1 is secreted by hepatocytes in response to growth hormone. One study suggests that the mechanism of decreased IGF-1 production in CFTR−/− mice results from increased sulfotransferase 1E1 activity, which impedes growth hormone responsiveness in hepatocytes (37). Other studies suggest that increased inflammatory cytokines result in a decrease in IGF-1, which is greater than the decrease in IGFBP-3, with an overall reduction in IGF-1 bioactivity (7). The role of cytokines in the pathophysiology of reduced IGF-1 production has been clearly established in sepsis (14–18), so it is plausible that inflammation plays a role in the reduced IGF-1 levels found in CF as well. A recent study demonstrated reduced IGF-1 levels in CF neonates prior to the onset of inflammation, lending credence to a more innate process involved in the pathophysiology of reduced IGF-1 in CF (19). Although it is generally accepted that serum IGF-1 levels are reduced in CF, our data demonstrate low levels of IGF-1 in the lung environment in patients with CF and link low levels of IGF-1 with impairments in innate immunity in CF. IGF-1 has been shown to improve the ability of primary bovine alveolar macrophages to phagocytose and kill bacteria (20). The mechanism is thought to be due to increased acidification of the phagolysosome. We have previously demonstrated that treatment with IGF-1 improves the survival and function of hepatic tissue macrophages (Kupffer cells) during a septic insult (12). IGF-1 also plays an important role in the migration of macrophages derived from human monocytic THP-1 cells, a process that depends on αvβ3-integrin signaling (38). Our current study clearly establishes a significant relationship between low levels of IGF-1 in serum and BAL fluid with impaired alveolar macrophage function in patients with CF. This is a novel finding and suggests that impairments in bacterial clearance are related to aberrant IGF-1 production in CF. Our current study is limited by small sample size and was not designed to investigate the mechanism of IGF-1–induced impaired alveolar macrophage function. Future studies will elucidate the mechanism by which IGF-1 impacts alveolar macrophage function. In summary, we provide further context for IGF-1 deficiency in CF by showing that levels are commensurately reduced both in the lung and the circulation. Whereas others have shown that IGF-1 insufficiency in CF is associated with growth restriction (39), ours is the first study, to our knowledge, to demonstrate that the ability of alveolar macrophages to kill a clinical strain of P. aeruginosa, a common and deleterious pathogen in CF, is also restricted by low IGF-1. Although our current study was not designed to determine the mechanistic effects of IGF-1 on alveolar macrophage function, our observation could lead to future studies investigating both the mechanism of effect of IGF-1 on alveolar macrophage function as well as the efficacy of IGF-1 treatment on bacterial clearance. Whether IGF-1 is equally important to the clearance of other airway colonizers like Staphylococcus aureus or Aspergillus fumigatus is a question of current interest and future research. Our observation that blockade of IGF-1 in BAL fluid limits the ability of normal alveolar macrophages to kill P. aeruginosa suggests that IGF-1 is essential to the function of these cells, potentially paving the way for directed, localized therapy. We thank Dr. Deborah Hogan for providing the clinical bacterial strains. This work was supported by National Institutes of Health Grant P20-RR018787 from the Institutional Development Award Program of the National Center for Research Resources (to A.A.) and a pilot grant from the Dartmouth SYNERGY Institute for Clinical and Translational Science at Dartmouth College (to A.A.).
. 2009. Disease-causing mutations in the cystic fibrosis transmembrane conductance regulator determine the functional responses of alveolar macrophages. J. Biol. Chem. 284: 35926–35938.
. 2006. CFTR regulates phagosome acidification in macrophages and alters bactericidal activity. Nat. Cell Biol. 8: 933–944.
. 2010. Cystic fibrosis pigs develop lung disease and exhibit defective bacterial eradication at birth. Sci. Transl. Med. 2: 29ra31.
. 2011. Dysfunctional CFTR alters the bactericidal activity of human macrophages against Pseudomonas aeruginosa. PLoS ONE 6: e19970.
. 2006. Analysis of bone mineral density and turnover in patients with cystic fibrosis: associations between the IGF system and inflammatory cytokines. Horm. Res. 66: 162–168.
. 2006. Inflammation is a modulator of the insulin-like growth factor (IGF)/IGF-binding protein system inducing reduced bioactivity of IGFs in cystic fibrosis. Eur. J. Endocrinol. 154: 47–52.
. 2009. Insulin-like growth factor-I levels predict weight, height and protein catabolism in children and adolescents with cystic fibrosis. J. Pediatr. Endocrinol. Metab. 22: 417–424.
. 2006. Treatment with GH and IGF-1 in critical illness. Crit. Care Clin. 22: 29–40, vi.
. 1988. Differential responsiveness of human breast cancer cell lines MCF-7 and T47D to growth factors and 17 beta-estradiol. Cancer Res. 48: 4083–4092.
. 2006. Insulin-like growth factor binding protein-2: contributions of the C-terminal domain to insulin-like growth factor-1 binding. Mol. Pharmacol. 69: 833–845.
. 2008. Insulin-like growth factor-1 improves survival in sepsis via enhanced hepatic bacterial clearance. Am. J. Respir. Crit. Care Med. 178: 149–157.
. 2010. Insulin-like growth factor-1 levels contribute to the development of bacterial translocation in sepsis. Am. J. Respir. Crit. Care Med. 182: 517–525.
. 2007. Interleukin-6 inhibits growth hormone-mediated gene expression in hepatocytes. Am. J. Physiol. Gastrointest. Liver Physiol. 292: G1793–G1803.
. 2006. The inhibitory effects of interleukin-1 on growth hormone action during catabolic illness. Vitam. Horm. 74: 317–340.
. 2006. Tumor necrosis factor inhibits growth hormone-mediated gene expression in hepatocytes. Am. J. Physiol. Gastrointest. Liver Physiol. 291: G35–G44.
. 2005. Interleukin-1 inhibits the induction of insulin-like growth factor-I by growth hormone in CWSV-1 hepatocytes. Am. J. Physiol. Gastrointest. Liver Physiol. 289: G227–G239.
. 2002. Tumor necrosis factor mediates hepatic growth hormone resistance during sepsis. Am. J. Physiol. Endocrinol. Metab. 283: E472–E481.
. 2010. Pigs and humans with cystic fibrosis have reduced insulin-like growth factor 1 (IGF1) levels at birth. Proc. Natl. Acad. Sci. USA 107: 20571–20575.
. 1997. Expression of IGF receptors on alveolar macrophages: IGF-induced changes in InsPi formation, [Ca2+]i, and pHi. Mol. Cell. Biochem. 177: 33–45.
. 1998. Effects of insulin-like growth factor 1 on neutrophil and monocyte functions in normal and septic states. JPEN J. Parenter. Enteral Nutr. 22: 127–135.
. 2006. Human alveolar macrophages are deficient in PTEN. The role of endogenous oxidants. J. Biol. Chem. 281: 5058–5064.
. 2006. Genetic adaptation by Pseudomonas aeruginosa to the airways of cystic fibrosis patients. Proc. Natl. Acad. Sci. USA 103: 8487–8492.
. 2010. Alternative activation of macrophages: mechanism and functions. Immunity 32: 593–604.
. 2010. Characterization of macrophage activation states in patients with cystic fibrosis. J. Cyst. Fibros. 9: 314–322. 2003. Alveolar macrophages: wielding the double-edged sword of inflammation. Am. J. Respir. Crit. Care Med. 167: 103–104.
. 2012. Potential role for alternatively activated macrophages in the secondary bacterial infection during recovery from influenza. Immunol. Lett. 141: 227–234.
. 2010. Alternative activation of macrophages by IL-4 impairs phagocytosis of pathogens but potentiates microbial-induced signalling and cytokine secretion. Blood 115: 353–362.
. 2012. Induction of alternatively activated macrophages enhances pathogenesis during severe acute respiratory syndrome coronavirus infection. J. Virol. 86: 13334–13349.
. 2009. Revisiting the role of cystic fibrosis transmembrane conductance regulator and counterion permeability in the pH regulation of endocytic organelles. Mol. Biol. Cell 20: 3125–3141.
. 2009. Defective organellar acidification as a cause of cystic fibrosis lung disease: reexamination of a recurring hypothesis. Am. J. Physiol. Lung Cell. Mol. Physiol. 296: L859–L867.
. 2009. Increased SULT1E1 activity in HepG2 hepatocytes decreases growth hormone stimulation of STAT5b phosphorylation. Steroids 74: 20–29.
. 2010. IGF-1 increases macrophage motility via PKC/p38-dependent alphavbeta3-integrin inside-out signaling. Biochem. Biophys. Res. Commun. 394: 786–791.
. 2004. Relation between serum Insulin-like growth factor-I and insulin-like growth factor-binding protein-3 levels, clinical status and growth parameters in prepubertal cystic fibrosis patients. Pediatr. Int. 46: 429–435.